Cozumel Hostel Lodging Accommodation Alternative Amigos! December 5 marked 20 years that Amigos has been offering lodging options on Cozumel!! Behind the tall walls that surround Amigos Hostel is a large garden, spacious areas, multilevel pool. This is a tropical paradise complete with coconut palm trees! Large pool at Amigos Hostel waiting for you to jump right in! Two large mixed dorms, Orange & Nopal Dorms are located at the end of the walkway. Walkway back from Pool to Dorm rooms. Orange on left side, Nopal on right side! Beautiful gardens surround the hostel living areas. Large selection of table or board games. VHS movies many treasured Disney titles from childhood! Computer with Wifi if you neeed to work! Amigos Hostel Cozumel has large pool table for your enjoyment! Large shared well supplied kitchen! At the far side of the communal palapa sites the private Avocado Room which has private bath, complete kitchenette AC, private terrace. Feb 2014 a covered area for smokers which is off the far side of the dorm area was added. Here too is a large selection of information for hostel travelers. BBQ grill for your cooking options. In this new common area we have posted all the flags of the previous guests here at Amigos Hostel Cozumel. Is your flag here? If not, come visit and make sure it becomes part of the Amigos Nation! At Amigos Hostel Cozumel we offer Dorm rooms for $12 US per bed and Private room for $45 US per night. Both prices do not include 19% taxes! 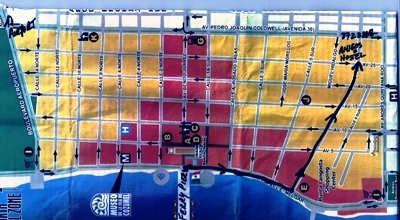 Complimentary extensive welcome briefing about Cozumel and the Amigos neighborhood including a map! Moped, car or bicycle rentals arranged as well as snorkeling tours to three different sites that depart from town! On site snorkel gear for rental; also available for use small coolers and old beach towels so you can enjoy the beach as well as bath towels in the event you forgot yours! Luggage storage on day of departure if leaving late. Check out of your bed, but store your bags so you can enjoy another day of scuba diving or exploring topside the beauty that is COZUMEL! With a total capacity of 19 people Amigos Hostel Cozumel, which is situated behind high walls, offers total relaxation and privacy to it's guests. The quiet residential street, Calle 7,allows easy walking access to the main square and commercial area of San Miguel de Cozumel. Map of Cozumel follow arrows to Amigos Hostel Cozumel! Located Calle 7 sur btw Ave 25 & 30 in Col. Centro Cozumel's Hostel Amigos is just five city blocks from the turquoise blue Caribbean Cozumel is so famous for.. Phone: 987-872-3868; cel with whats ap: 987-119-9664 phone calls during office hours (8:15 am -10 pm Q. Roo time). Amigos Hostel Cozumel awaits your visit, FRIEND! Come to Cozumel for professional yet affordable dental care. Doctor Yazmin is a bilingual professional who accept walk ins as well as appointments, located close to the Amigos Hostel Cozumel. Visit their web page Cozumel Dental Care for more information! We here at Amigos personally have been Yazmin's patients for over 10 years and are very pleased with all her work. Hostel Management On line resources for hostel.